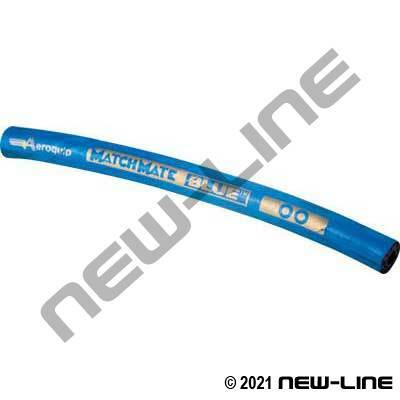 GH195 is a double wire braid hydraulic hose built with special AQP elastomers for use where higher operating temperatures are encountered and standard SAE100R2AT two-wire hose will not stand up. This hose is suitable up to 300°F with petroleum based fluids and certain fire resistant fluids (must contact Aeroquip with application). GH195 meets MSHA flame resistance specifications, ABS, EN 853 Type 2SN, DIN 20 022 Type 2SN, and SAE100R2AT requirements. Typical Fittings: 1A Series permanent crimp (-20 size uses 1AV/1AT Series). Construction: Tube: Black AQP elastomer. Cover: Blue oil and weather resistant AQP elastomer. Reinforcement: Two high tensile brass plated steel wire braids. Temperature Range: -40°C (-40°F) to +150°C (302°F). AQP is not rated for steam use.